I'm sorry I was missing on Wednesday - I was busy all day and simply didn't have time to create a post for you. Unfortunately the rest of the week has been spend outside of my creative zone so I STILL don't have anything much to share. So....how about a Mumblings Catch Up instead? - If you go HERE you can see all the winners from the AQS show in Paducah. Some amazing quilts!! - THIS is really pretty - you'll have to use the translate feature to get the pattern. - If you have problems with your sewing machine pedal moving about on the floor, perhaps making one of THESE might help. - You have to go and check THESE out!! Vicki is a vendor at a big craft show and she has created these amazing flowers to showcase her hand dyed fabrics. She is kind enough to share how to make them with us. I think they'd would look amazing on a sewing room wall!! - And further on creating flowers, how about THIS? - Have a look at the incredible creations done by THIS artist!! And those created by THIS artist as well. - If you would like to make something to add to your fall decor (or to give as gifts), have a look at the project found HERE (scroll down and you'll find the pattern and instructions). - Mary Corbet has released a beautiful free embroidery design and you can find that HERE. - For those of you who are into scrapbooking and card making there's a free online magazine available HERE. - Pam Kellogg has been re-releasing a lot of her beautiful cross stitch patterns and you can find more info about that if you visit her HERE. Be sure to scroll down to see them all (and she's adding more all the time so check back regularly). - If you are interested in textile art, you might want to check out the amazing variety of information that can be found HERE. AND - just so I can have some sort of picture to show, how about a slightly risque cartoon? Sorry if this offends anyone!! Over the weekend I made a few of these little fellows which might end up being my ornament series for this year. For those of you who don't know every year I make about twenty ornaments which are then used as either a 'bow' on a parcel or are given as little gifts in and of themselves. 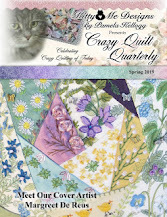 The design is by Kathy Shaw and I'm testing it for publication in the spring issue of the 'Crazy Quilt Quarterly' magazine. - If you would like to make a little fall-ish gift for someone or even add to your own fall decor, perhaps you'd like to use some of your scraps to make one (or several!) of THESE. - I like THIS!! Such a great way to use a quilt panel. And while you're there, check out their other patterns too (HERE). - THIS is a beautiful ornament - good for any time of the year! - And how about THIS sweet little cross stitched scarecrow? Or THIS cute fall scene? While you're there, hit the translate button and then have a peek through her sidebar and see all the links to some other really amazing little cross stitch patterns. Another anonymous quote..."Nothing annoys me more than when someone expects you to be okay with something that they wouldn't be okay with if you did it"
Quite literally, it's a 'little' something! This little fellow (measuring about 6" tall) is something I knitted for our littlest 'grand' out of some scrap yarn I had left over from his Paw Patrol sweater. The pattern is 'Little Kindness Monster' by Rachel Borello Carroll and can be found on Ravelry. I altered it slightly and crocheted his arms and legs. - HERE is a little tatting pattern that some of you might find interesting to try. - There's a link to a cute wee Halloween cross stitch pattern HERE. - Have a peek at the incredible embroideries by THIS artist (check out her people as well). - For those of you who crochet, perhaps you'd like to try THIS pattern. - Sometimes the simplest solutions for storage are the best as THIS will attest! Another anonymous quote..."The older I get, the more I realize the value of privacy, of cultivating your circle and only letting certain people in. You can be open, honest, and real while still understanding not everyone deserves a seat at the table of your life"
The latest barn is done! 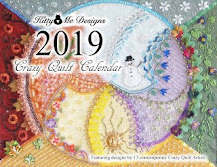 Now I'm itching to start another one but I have a couple of other things that I need to do for the 'Crazy Quilt Quarterly' magazine so I will have to change gears a bit. Never fear, there are more barns just waiting their turn! - I'm showing you THIS for inspiration and you can find the pattern for the flowers HERE. - For those of you who like Halloween, how about THIS? - How about the work of THIS amazing artist! And THIS one too! - There are links HERE to some pretty autumn-themed projects. - If you happen to have some doilies stashed away in a drawer somewhere, maybe one of the ideas found HERE might help you use them. - There are some really cute ideas HERE for making Christmas decorations from dollar store items. A few are not so special, but there are others that are really nice (esp. the snowman made from fish bowls - I love that one!). - THIS is an adorable little sweater for a toddler. - Sorry about the abundance of Christmas ideas, but when I come across them I have to share because I know they will just get lost. So....have a look at the tutorial HERE for an adorable snow globe project for your Christmas decor (and it would make amazing gifts too!!!). 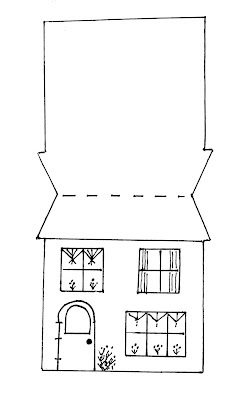 - THIS is an interesting bag pattern - but I think I'd like to use it as a sewing supplies caddy rather than as a purse. Your quote..."Refuse to please others at the expense of your emotional well-being. Even if it means saying 'no' to people who are used to hearing 'yes'. Our littlest 'grand' is currently in like with Paw Patrol and his favourite character happens to be 'Chase'. I stumbled across this pattern and of course it had his name on it in glowing neon so what's a grandma to do? The pattern is HERE (there are several other characters that come with the pattern) and I used Paton's Astra yarn. If you embiggen the picture hopefully you can see the amazing buttons I found - they came all the way from Ireland! - Have a look at the incredible array of themed quilt blocks available on THIS site. So much fun for kids!! Just check through all the categories at the top. - And there are tons of interesting quilting resources available HERE. - If you have a special hankie in your collection, perhaps you might like to use it to make one of THESE for your Christmas tree. - Have a look at the amazing work done by THIS artist and look at what she uses to create with! - And while you're looking at amazing work, check out what THIS artist does! - THESE would make a nice addition to your fall decor. 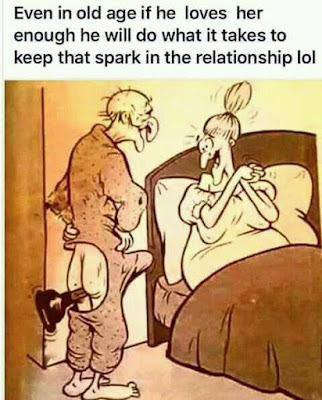 - Here is your laugh for the day....I've watched it twice and laughed til I cried both times. Have a look HERE. Make sure your sound is on! Another anonymous quote..."Just because some people are fueled by drama doesn't mean you have to attend the performance"
Firstly, I want to extend my prayers and thoughts to those who are in the path of Florence and also Typhoon MangKhut....be safe! There has been some progress on the latest barn, albeit not much. It's about ready to start quilting now - no doubt you will notice the basting threads! - There are lots of great quilting tutorials HERE. - Lots of amazing quilts to see if you scroll through THIS post. - THIS guy is a real cutie! - THIS one is for you Starbucks fans. - HERE is a simple little project that might be something that would sell well at a craft fair or bazaar. - There's a really nice bag tutorial HERE. This is a quote from Mother Teresa..."I alone cannot change the world, but I can cast a stone across the waters to create many ripples"
The past couple of days have been rather dismal on the stitching front so rather than show you my lack of progress on my barn I thought I'd show you what I DID do (and never let it be said that there is any lack of stimulation here at Chez Magpie!!). This pile of fabrics began life as men's shirts (mostly - the leaf patterned one was a ladies blouse). I've discovered that finding various shades of fabrics that are fodder for landscape quilts is an expensive proposition if you look in fabric shops. All of these were scored at thrift shops for very little in the way of cost and all I needed to do was spend an hour or so cutting them apart. A couple of these have marvelous texture too (the gold one is very fine corduroy). I don't worry overly much about fabric content because these are well washed before I use them and it's doubtful that any of my barns will ever be washed later on. - THIS is a fun use for your yarn scraps! - Oh my - THIS quilt is amazing! It was made from a Piecemaker's calendar from several years ago (be sure to scroll down to see some of the blocks close up). THIS link takes you to the original pattern/calendar. - While I was poking about on the Piecemaker's site, I stumbled across THIS gallery and thought some of you might find it fun to look through. - THESE made me laugh - talk about attitude! - I like THESE guys - they'd make wonderful gifts. - Many of you are aware that Pam Kellogg is running an ongoing project on her blog called 'The Never Ending Sampler' where she regularly releases two or three free designs for making into a sample or using individually on things like crazy quilts. Anyway....she has released the first three bands in their entirety and you can find more information HERE. - For those of you who like owls, go HERE. Another anonymous quote..."Sometimes when you're in a dark place, you think you've been buried, but you've actually been planted"
First of all, thank you so much for all the happy anniversary wishes for Jack and I. We had a lovely weekend - two meals 'out' on Saturday and a relaxing day on Sunday. Perfect way to celebrate! I managed to do a little more on the latest barn...added the fence posts, the birch tree, and a shrub on the right. Both the tree and the shrub need more work before I will be happy with them. rainy here so the light isn't good. - I don't often share anything of this nature on my blog, but I'm going to make an exception for THIS. Depression still often bears the stigma of being a taboo subject - something to be hidden, something to be ashamed of. Yes, this particular post I've shared discusses it from the standpoint of postpartum, but the symptoms are the same. I have read a lot on the subject and have to say that what was written here is remarkable and one of the best things I've read. I know personally how debilitating this disease is - I know what it's like to live with it - I know what a family goes through - I know the denial, the refusal to believe and the shame. I know all too well and if, by my sharing this (and perhaps you also sharing), it helps someone then I am happy. Don't wait to seek help and don't be ashamed. - THIS link takes you to some free Christmas-themed mug rug patterns. - And THIS link leads you to the clickable link to create amazing Christmas ornaments. - Have a look at the pieces done by THIS artist! And those done by THIS artist too! - I love THIS afghan! Link takes you to a free pdf file of the pattern. - For those of you who are interested in felting, perhaps THIS might be something you might like to try. - Sue Bleiweiss has announced registrations for her 'Artist Studio Boot Camp' class and if you'd like more info check her post found HERE. If you follow the link in her post you can get the full details. - The knitters might find THIS post interesting about how to make neat color changes in your work. Today the quote is from Maya Angelou..."Hate: It has caused a lot of problems in this world, but it has not solved one yet"
At the risk of breaking your computer, I thought I'd share a picture of moi taken by my long-suffering husband for inclusion in an article I'm writing for an online quilting magazine. Don't say you weren't warned!! - THIS is so pretty - I'm sure there has to be a use for it in our stitching somewhere! - HERE is a pretty tote bag pattern which would be great for stash busting, or how about making one for a child that's an 'I-Spy' version? - How about making THIS one to carry at Christmas time (or to use for a gift bag)? - If you have a little girl in your life, perhaps one of THESE ideas will spark a wonderful Christmas gift for her! Or maybe THIS one? - There's a great tutorial HERE for printing onto fabric using your computer and freezer paper. - Have a scroll down through all the amazing flowers made from felt found HERE. Some really pretty ones! - Have a peek at the wonderful little creatures on THIS site. Today's quote..."No is a complete sentence. It does not require justification or explanation"
Becki left a comment on my post for the needlebook tutorial raising the question about what 'CQTeers' stands for and more about our little group so I thought I'd answer here in case anyone else might be interested. Our little group began in approximately 2004 and consisted of four members (told you it was little!!). The name 'CQTeers' came about because when we began we were primarily doing crazy quilting (hence the CQ) and the 'Teers' came from the fact that one of our members was obsessed with the 'Mouseketeers' of Walt Disney and Mickey Mouse fame. Over the years our membership has pretty much stayed the same with a couple of people dropping in and out. Currently we are at three members and try to meet once each month, alternating homes. EDITED TO ADD: We also have one long-distance honorary member! Each hostess provides coffee and a dessert (we each bring our own lunch) as well as some sort of program for the afternoon. We either learn a new technique or create a small project. Of course we also enjoy a lot of conversation and a show and share session. Most months we also go home with some 'homework', most often in the form of a theme that we use to create an ATC (Artist Trading Card) to exchange at our next meeting. By now we have amassed quite a collection!! - HERE is a rather pretty cross stitched maple leaf pattern. - Have a look at the extraordinary work of THIS artist - made with thread!! - Perhaps you'd like to make some of THESE to indulge yourself (or...think ahead to THAT day in December!). - Some of you might enjoy having a look through THIS gallery of different variations on log cabin quilts. - My friend Pam Kellogg has just released some new inspirational cross stitch designs and you can read more about them HERE. - And Kathy Shaw has just opened registration for her free ICQC-104 Advanced Motifs online class and you can find more info through the link found HERE. - There's a tutorial HERE for a lovely lace cloth book. Another anonymous quote for you..."Never give up on a dream just because of the time it will take to accomplish it. The time will pass anyway"
You will need to print the pattern to the size you require (mine ended up measuring approx. 8" x 3 1/2", but size is up to you). SUPPLIES: pattern; three pieces of light-colored felt in the size of your pattern; freezer paper (optional); assorted embroidery floss in colors of your choice; and a piece of HeatnBond (also optional). HOW TO: Trace the design onto freezer paper and iron onto felt (this step is optional, and you can use tissue paper instead). 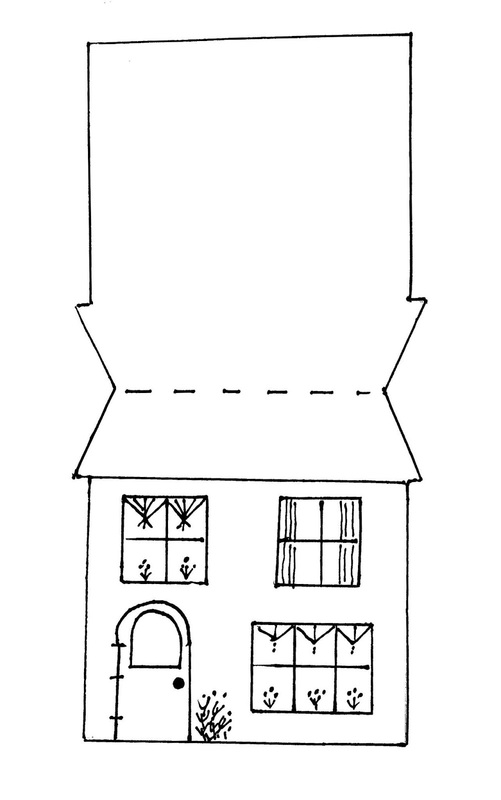 In order to transfer the windows, etc. pattern onto the felt it's helpful to use a needle to make a tiny hole at the outer corners and then use either a fine tip marker or pencil to mark through the holes. Then when you remove the freezer/tissue paper you can easily see the marks. Embroider as desired. If using HeatnBond, iron onto the back of the outside piece and then onto another piece of felt so that the back of your stitching is covered. Trim inner felt to match the pattern and embroider around the outside using a buttonhole stitch in a thread that matches the color of the felt closely. Cut another piece of felt into a rectangle that will fit inside the needle book for the 'pages' and stitch across the dotted line as shown in the pattern to hold in place. At this point I fold the needle book the way I want it and run another line of stitching across the roof top to hold in place. There you go - a needle book, courtesy of MA and the CQTeers! - The SNAD (San Francisco School of Needlework and Design) has announced their newest stitch at home challenge "Make Do and Mend" and further information, along with rules, and entry form can be found HERE. - If you happen to be creating a crazy quilt undersea project, perhaps you might like to make one or two of THESE to include! - THIS, along with a bar of pretty soap, would be a really nice gift to create for Christmas giving. - Kathy Shaw has opened registrations for her very first crazy quilt retreat which will be held Feb. 8-11 in Alabama (USA). If you live in the area, or plan to visit, check out her post HERE for further details. - You know how sometimes the V neck in an outfit is just a little too riske? Making one of THESE might just be the answer (and it's pretty too!). - THESE just plain boggle the mind! Today the quote is from Mark Twain..."Kindness is the language that the deaf can hear and the blind can see"